This add-on gives you two additional sets of custom fields you can add to service orders in addition to the generic order custom fields which apply to both fulfillment and service orders. This add-on requires that you also purchase the custom fields add-on. The Service Order Extra Fields will appear below the Order By and Ship To boxes and above the PO # box on the service order edit page. In addition to this set of fields you will also have a link below the Notes entry box that links to an Edit Work Details page. The Edit Work Details screen can be fully customized with extra fields of information you'd like to capture about this job. 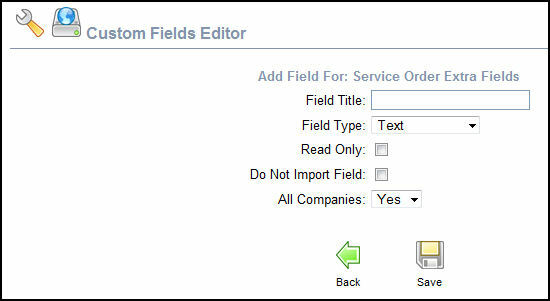 Go to Tools -> Custom Fields Editor to define your extra Service Order fields.